If you run a blog or plan out your promotion planning Asana will be a great asset to your business. Asana is a task management tool, now I have tried almost every task management platforms and each one seems to be missing an essential part. When it comes to organizing your business Asana is a great tool to use, you can use it to keep track of your client work, project management, blog management, sponsorship tracking, and even promotional planning. When you sign in to Asana, it is a complete black slate but using projects you can divide your content up to make it even easier to track multiple "projects" that you are working on. 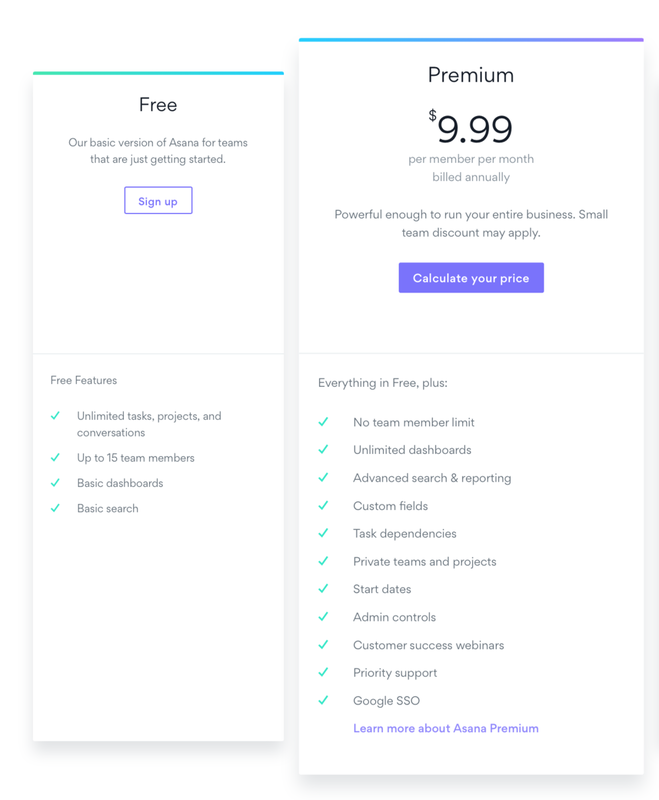 To make it even better, Asana has an awesome free plan that allows you to use the entire platform without bombarding you with that annoying upgrade popups. Most platforms restrict their free options to the point where it's near frustrating to test the tool because you aren't allowed to see if you can benefit from the tool before investing in it. With Asana's free plan you get unlimited tasks, projects, and conversations which if you have a small team you will still be able to invite your team without committing to another monthly fee. Asana is still a very good tool if you only use the free plan, as a solopreneur, I find it so useful with all the little details that I need to remember with every part of my business. Running a blog can become very overwhelming if you are not on top of the task you need to complete, working on multiple blog posts at a time you begin to notice that you missed out on an affiliate link or you didn't make enough graphics when you were batching. Batching is key when you are a blogger or podcaster! So using Asana with your blog management can help tremendously when creating content, usually, when you are planning your blogs you need key things like graphics for each platform, post drafts, and content upgrades. Now, that's just the really main pieces but then you have all the little pieces like post proofing, post scheduling, content upgrade funnels and social media promotions. There are so many things that go into a blog, and creating different projects for your content help you to keep track of all the moving parts. Some projects I would create in my asana dashboard is Blog post ideas, content upgrades ideas, [Month] blog posts, [month] content upgrades, and social media promotion planning. Whenever you come up with a new program, product or blog post you have to have a plan to promote it; Where you are going to share it, will you run an ad, who are you targeting and for how long. Some promotion schedules cover every step of promoting a specific product or service, the time you take in planning your promotions the more successful the outcome. Most businesses use sponsorship to earn more side income, taking on sponsorships you need to ensure you're tracking the different responsibilities that are expected. You may need to post a certain amount of times or you need to have a central place that holds your sponsored posts to ensure you don't over schedule or even under schedule the number of sponsor posts in a month. I love that Asana integrates directly with my Google calendar so that even if I don't log in to the Asana dashboard my tasks are in sync so I never miss a beat. Now I use Asana to track my custom website designs, I have a template for all the tasks that go with every custom website that I build to ensure I don't miss anything. The fact that I can add my clients to the project so they can see the progress I am making and any information I need from them I add it as a task and the complete the task and upload any information I need right to the task dashboard. When they marked it complete I receive a notification on my phone and in my email. Taking the time to create a template for each project type I have saves soooo much time, you never really know how much time you are wasting until you free some of it up. I just copy the project type and all the tasks and subtasks are copied ready for me to use fresh for each client. I just go in and add them as a team member for that project and get to work, this year I have used asana for my project management and my clients loved it. Overall Asana has been a great asset to my business, I love that I can integrate my asana directly with my calendar and Zapier which completely changes the game. Asana helps me keep track of all the different tasks in my business and helps make it easier working with my different team members. All the steps are there ready to go with every project I start so I never have to worry about missing anything. If you decide to give Asana a try let me know in the comments below, and if you need extra help with setting up your Asana board or how to maximize it be sure to check out my "Organize your Business for 2018" training where you will learn how to automate your email follow up, lead funnel, project management, and document management using Asana, G suite, Zapier, and Dubsado.